The characters in this short incident fascinate. Two years ago on this day we took a look at Anna. 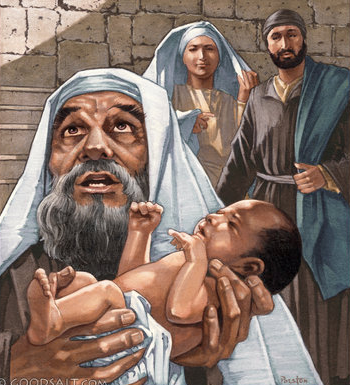 Today let's look closely at Simeon to learn what kind of a man God tells His secrets to. 1. He was a spiritually attuned man, focusing on the spiritual solution to the political and natural situation as he lived in expectation "...waiting for the Messiah to come and rescue Israel" - Luke 2:24 NLT (compare to Isaiah 40:1,2). 2. The Holy Spirit was active in his life. Luke refers to the Holy Spirit in relation to Simeon three times in this short segment. The Spirit's presence seems to have been visible or obvious in some way. Luke wasn't there, so some eye-witness must have told him about these things. Who? Mary perhaps? What did she see that told her the Spirit was on Simeon? Or maybe the Holy Spirit within her gave witness in some way that here was a Spirit-filled and -controlled man. "Unquestionably obedience is a high virtue, a soldier quality. To obey belongs eminently to the soldier. It is his first and last lesson, and he must learn how to practice it all the time without question, uncomplainingly.... The gift of the Holy Spirit in full measure and in richer experience depends upon loving obedience." E. M. Bounds, Complete Works of E. M. Bounds, Kindle Edition, p. 52. 4. He was bold in his blessing. Upon meeting Joseph, Mary and Jesus, he took the infant in his arms and prayed a blessing of thanks to God and prophecy Jesus, saying things that were outrageous if they weren't true (Luke 2:29-32). 5. He held nothing back, even the uncomfortable bad news. After blessing Joseph and Mary, Simeon said some things to Mary ("yes, a sword will pierce through your own soul also" - Luke 2:35) that must have puzzled her and made her heart sink. Let's determine to be like Simeon in these ways, looking to God for solutions to our problems and situations, allowing the Spirit access to our lives, responding to His promptings with obedience, even to the extent of uttering His words of blessing—and warning. PRAYER: Dear God, may Your Spirit have full access to me today. Help me to grow in "loving obedience." Amen. "Almighty and ever living God, we humbly pray that, as your only-begotten Son was this day presented in the temple, so we may be presented to you with pure and clean hearts by Jesus Christ our Lord; who lives and reigns with you and the Holy Spirit, one God, now and for ever. Amen."